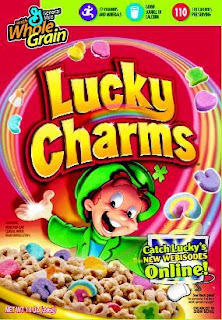 Life with Giggles: Lucky Charms - whole grain cereal=MARSHMALLOWS! I like Lucky Charms cereal... but ONLY for the marshmallows! Yep, I'm the one who picks them out and eats all the marshmallows! I actually wish I can just buy the marshmallows so I can snack on them at my desk at work and be a happy camper. This brings me to Mr. Newlywed Giggles. He actually buys cereal for himself and usually leaves me to buy cereal for myself. Hilarious, I know. When we go to the food store he picks out his cereal and I pick out mine. Mrs. Newlywed Giggles cereal list consists of: Frosted Flakes, Cinnamon Toast Crunch, Lucky Charms, Fruity Pebbles. The marshmellows are the best part for sure!! The more sugar the better in my book. Lucky Charms, Frosted Flakes, Cocoa Krispies, Captain Crunch, Honey Smacks, Apple Jacks, I could go on and on. My husband will generally eat anything I will, but he eats Grape Nuts - I can't imagine anything grosser. I am with you on the Lucky Charms and Fruity Pebbles! I also love Golden Grahams. 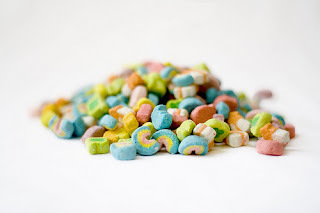 Whenever I eat Lucky Charms, I eat all of the actual cereal and save the marshmallows for the end! My hubs and I are the same way! His fav's are Fruity Pebbles and Oh's and my fav's are Cookie Crunch and Captain Crunch! We love captain crunch too!